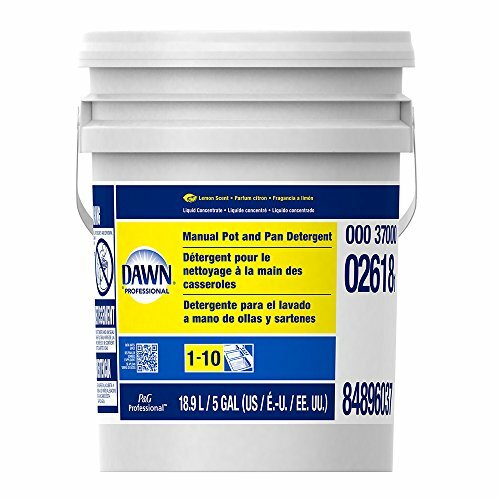 Dawn manual pot and pan detergent is a highly concentrated liquid dish soap that has the grease-fighting power for tough jobs. This dawn lemon dish soap is specially formulated to help remove greasy food soils from pots, pans and utensils. It can save you up to 6, 000 gal. Of hot water* and provide up to 512 sinks per case. **Dawn dish detergent can work as an all-purpose cleaner for a variety of task areas and items, including three-compartment sinks (wash sink), counter tops, dining areas, cooler Doors, Windows (outside and inside), portable equipment, trash receptacles, coffeemakers, drive-thru menu boards, and Tile walls.Tested against a leading private Label based on typical product performance, sink sizes and washes using four sinks a day**based on recommended dosage of 1 oz. Per 10-gal. Sink and applies only to cases with four 1-gal. Bottles diluted per package instructions. Results may vary based on dilution needs. If you have any questions about this product by Dawn Enterprises, contact us by completing and submitting the form below. If you are looking for a specif part number, please include it with your message.